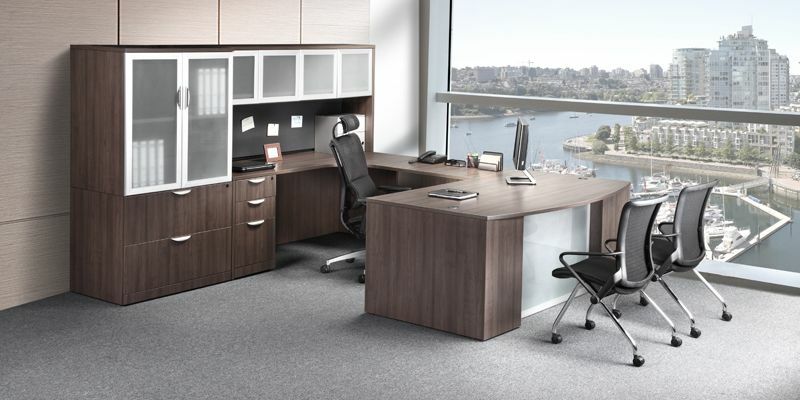 Start looking for office storage options and you’ll discover a world of possibilities: open shelves, lockable cabinets, glass or laminate doors, and combinations of all of those. If selecting the right one for your space feels a little daunting, consider these three questions to help narrow the field: What will you be storing? A traditional set of open shelves works great for books and DVDs that you access often, while a bookcase with glass doors will protect your memorabilia. If you have important documents — or a tasty lunch — that needs protecting, solid lockable doors may be the way to go. How much space do you have available? A spacious room might comfortably take two full-height shelving units, where a small or oddly-shaped room needs a compact option. Measure your space, consider existing windows and doorways (you don’t want furniture blocking your light or your movement), and always look for dimensions when shopping! Are you looking to match or contrast your current decor? Our bookshelves come in a variety of finishes, from dark Espresso to light Maple, in styles traditional to modern. Choose the same colour for everything or mix it up for variety; either way, we’ll make sure you love your purchase. For storage with a little bit of everything, consider our Performance Classic Cabinet/Lateral File Combo. It features 3 mm PVC Dura-Edge detailing, adjustable shelves, and drawers for legal or letter files, in your choice of seven available finishes. Visit Source today to talk shelving with our experts, and get the furniture that’s right for you. Source Office Furnishings – Making Your Office Work Better!